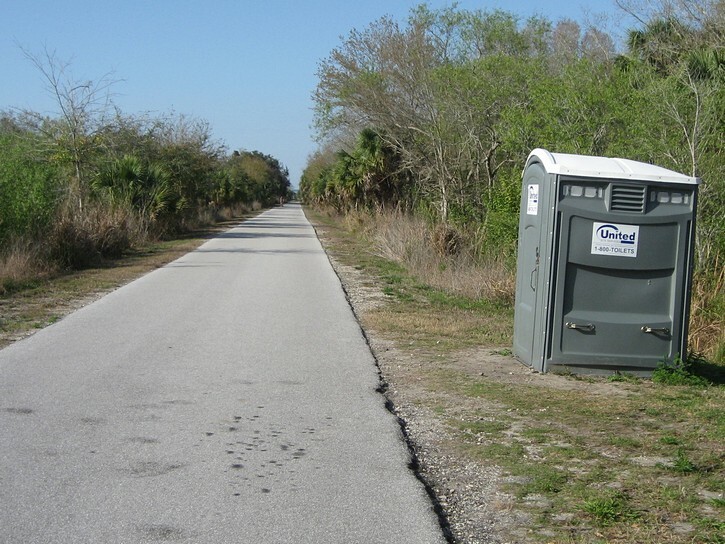 The Legacy Trail features 15 well appointed rest areas, some of which include outhouse toilet facilities. It also has a nice paved surface that’s 12 feet wide, so there’s plenty of space for pedestrians, rollerbladers, and cyclists. Although the trail intersects with roads every couple of miles, it is fairly isolated from vehicular traffic. 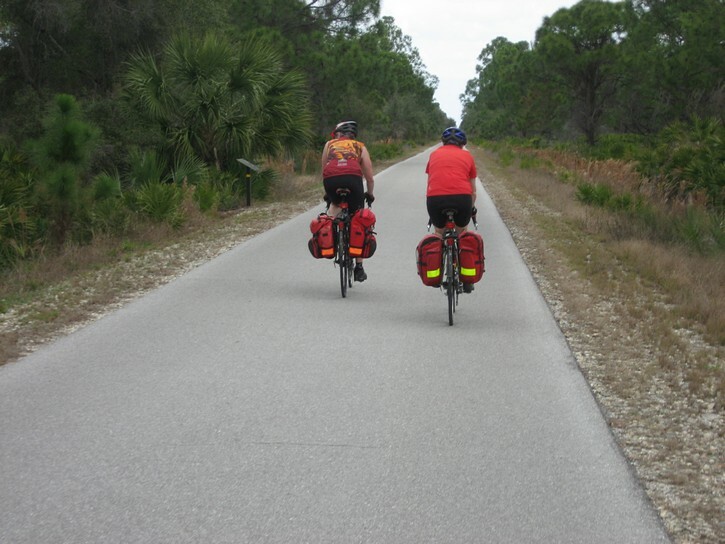 As is the case with many cycling routes in Florida, the trail is exceedingly flat (except for one man-made hill). 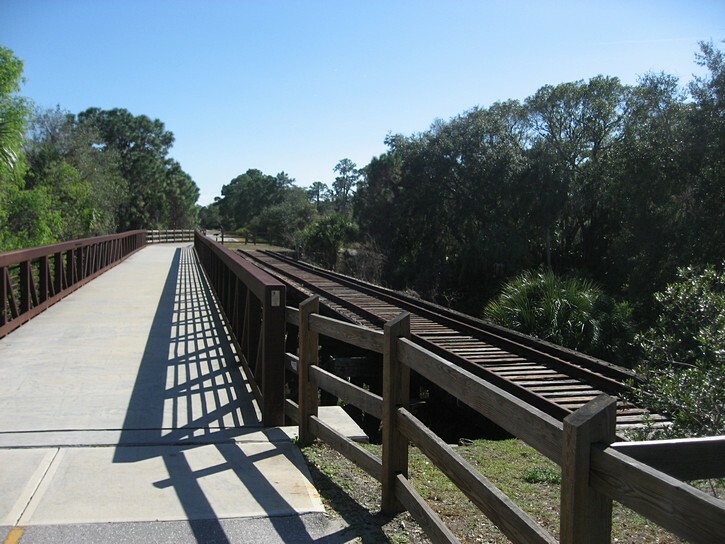 The layout of Legacy Trail is very straight because it is built on an old railroad line. 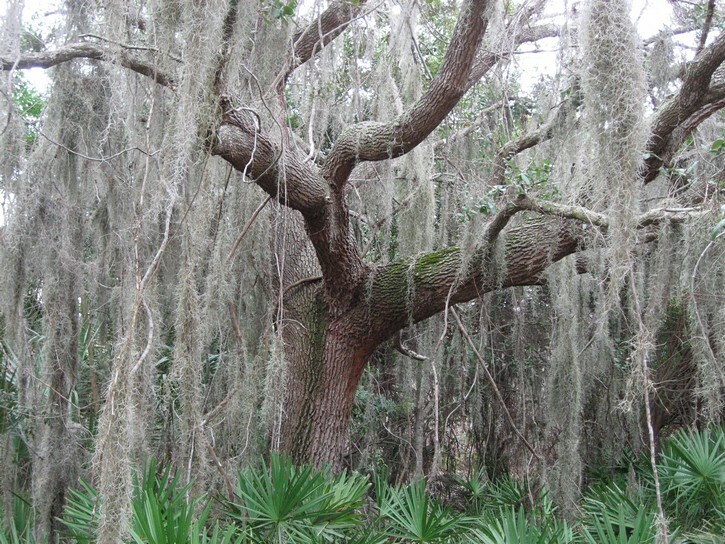 It roughly parallels the shoreline of Florida’s west coast, but is situated about a mile or two inland. While its scenery is not wildly spectacular, it is very pleasant and above average for this type of trail. Much of the trail runs through a low level wooded area, although it does pass through some open spaces, including a few farm fields. It also has display signs at regular intervals that explain the area’s history and natural environment. 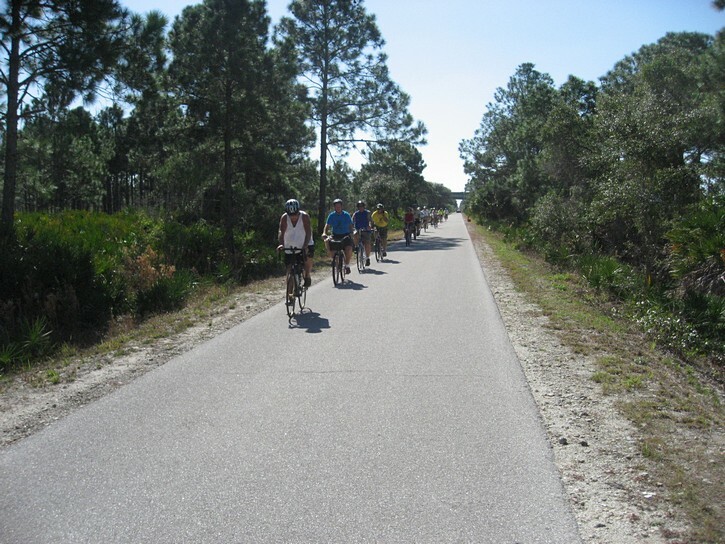 Although the Legacy Trail, is only 12 miles long, you’ll have to cycle an additional four miles if, for example, you start the ride from Siesta Key. 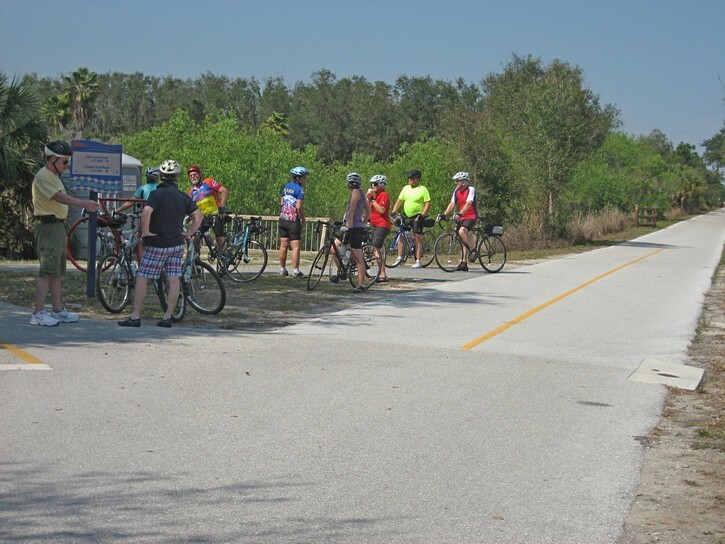 Moreover, cyclist have the option of extending their ride by another four to five miles by continuing on a different trail network which runs south of Venice (the Venetian Waterway Park Trail). All of this adds up to a total of 20 miles one way, or 40 miles (64 km) for a round trip. When planning your ride, it should be noted that there are almost no places directly on the trail where you can stop to buy snacks or something to drink. There is one convenience store right next to the trail towards the south, and it may be possible to find others on some of the side streets, but other than this, it’s best to bring any supplies you’ll need. While this article provides information for a longer ride, the Legacy Trail is also well suited for people who prefer cycling shorter distances. For example, you could bring your bike by car to the trail parking lot located at 7905 McIntosh Road, and start your ride from this point. From here, you could cycle part way to Venice. There is at least one good restaurant located a little ways before Venice (more on this later). You could stop there for a leisurely lunch and head back in the afternoon. This makes for a shorter ride that would probably be within the means of occasional cyclist who may not be used to pedalling longer distances. Whatever the case, this article will start off by describing a longer ride that begins in Siesta Key. Why there? 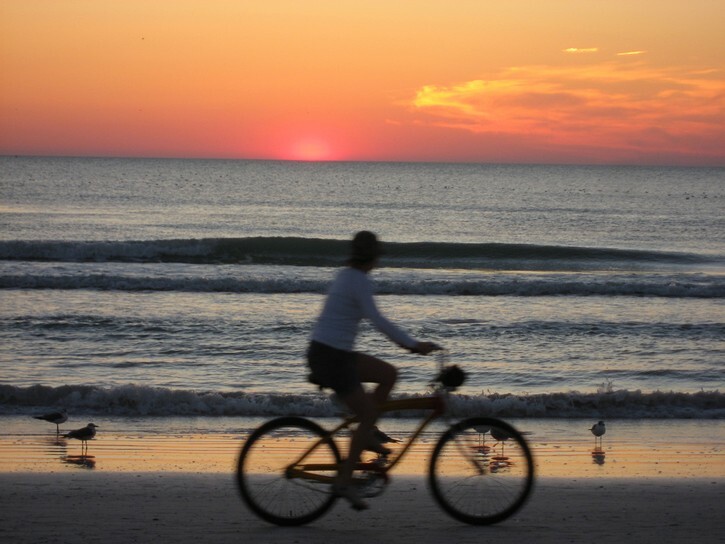 Well, Siesta Key is where the author often stays for winter getaways, and it is centrally located for various regional rides. 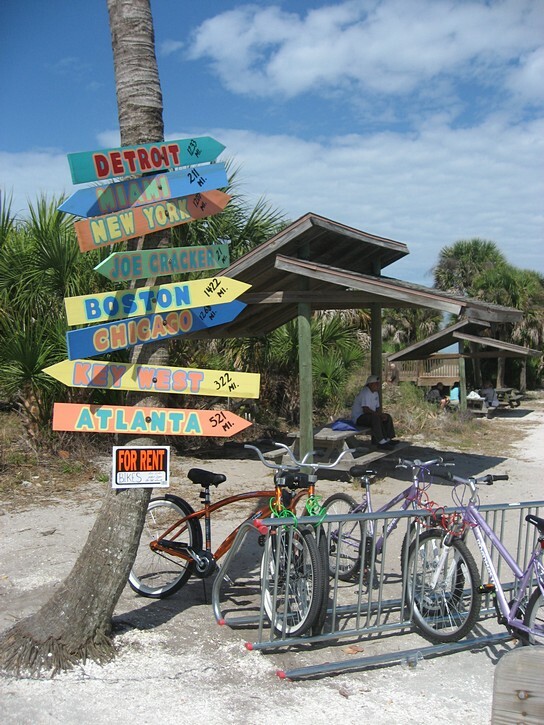 It has two places where you can rent real road bikes and a beach that is rated as one of the nicest in America (it is composed of extremely fine white sand). Departing from Siesta Key means taking Stickney Point Road to get off the island. Although it is a fairly busy road, the first part has a 3 foot paved shoulder. 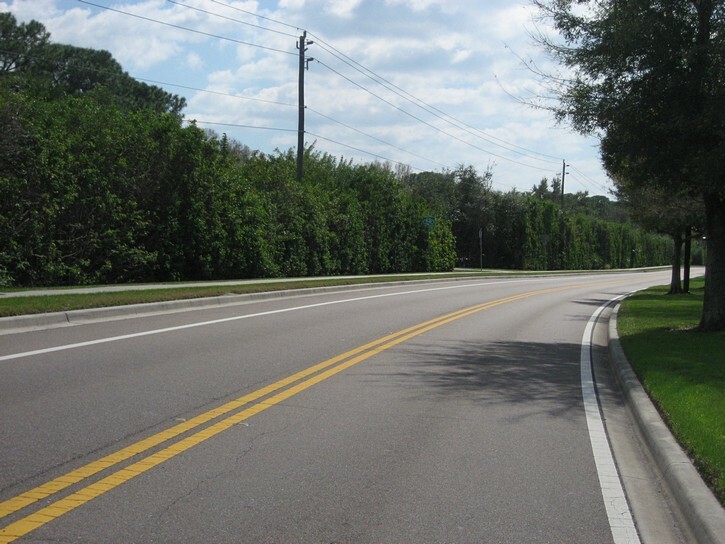 Unfortunately, it soon intersects with a major road called the Tamiami Trail (Highway 41), and you quickly discover the side of Florida which is decidedly bicycle-unfriendly. 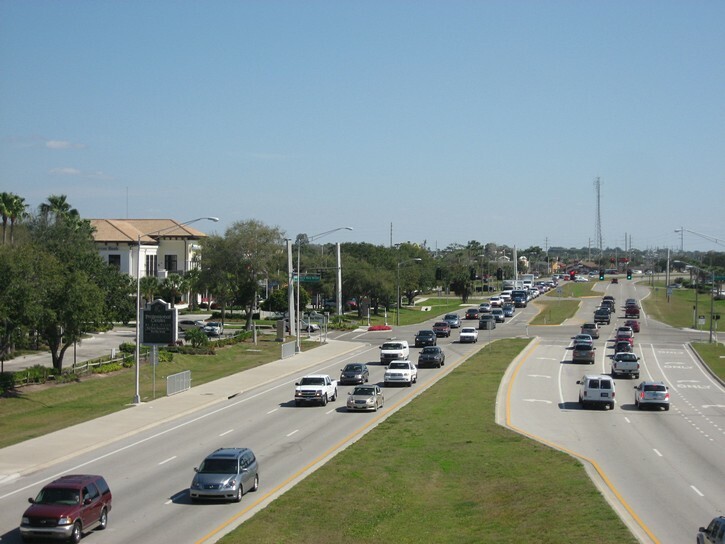 With all the exit and turning lanes, these two roads are 9 to 10 lanes wide where they meet. In other words, this is the kind of intersection that’s considered a no-go-zone by many recreational cyclists. 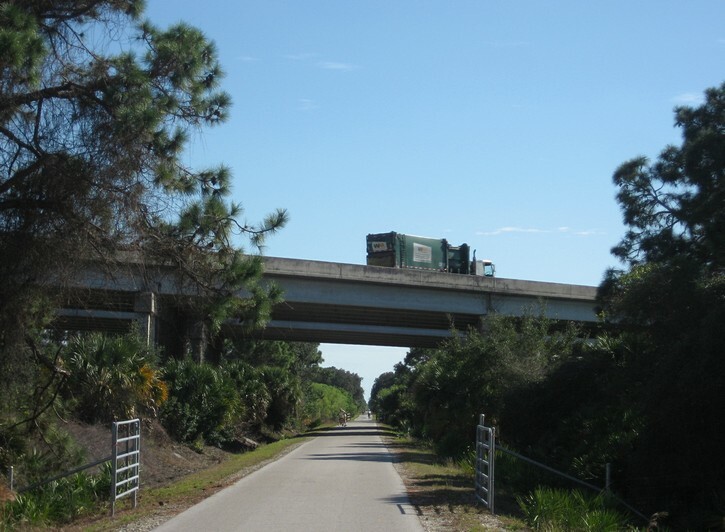 Unfortunately, you have to cross the Tamiami Trail Highway to get to Gulf Gate Drive, which is located about 200 yards south of the intersection. 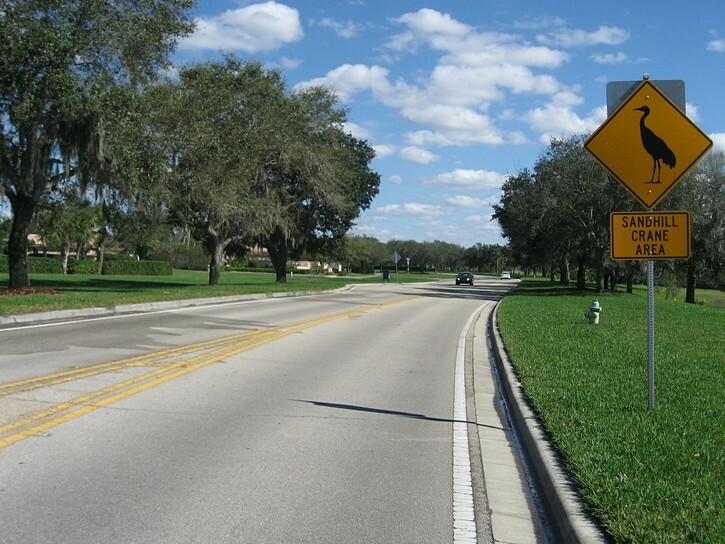 Rather than try to cycle through the dreadful intersection, you may want to walk you bike across the Tamiami Trail Highway, turn right, and then walk 200 yards on the sidewalk. Another option is to bypass the intersection by turning right from Stickney Point Road onto a small side street called “Avenue A”, and then head east by cutting through a parking lot for a local bank (right after the Best Western Hotel). You’ll now be lined up with Gulf Gate Drive, and riding across Tamiami Trail Highway at this point is easier than at the main intersection. Because of the shopping malls in this area, the first block or two of Gulf Gate Drive can be a little busy, but it soon becomes a nice quiet residential street with an excellent bike lane. Stay on it until you come to end at Beneva Road in a little less than two miles. You will then turn right onto Beneva Road, continue about 300 yards, and turn left onto Palmer Ranch Parkway. Although you don’t have to stay on it very long, Beneva Road is a fairly busy four lane street with no shoulder of any kind. It’s rideable for a short distance, but it’s not ideal. 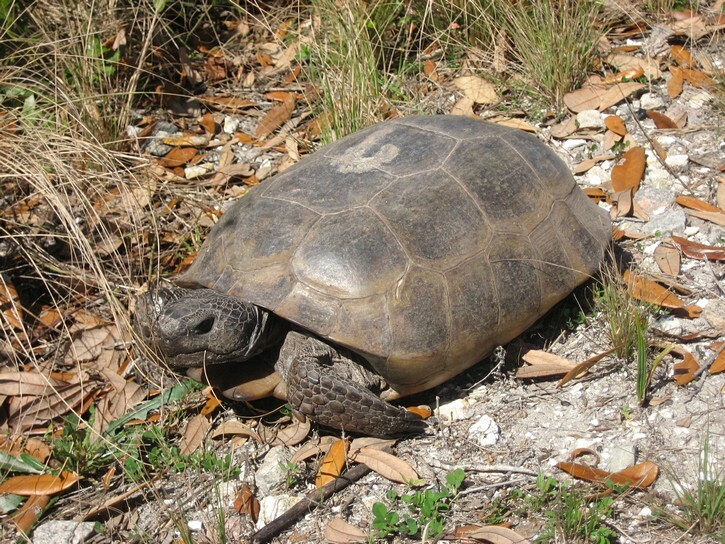 Under such circumstances, many people in Florida ride on the sidewalks. It is legal to do some areas, but not everywhere, and it’s not clear what the situation is along Beneva Road. While sidewalks should generally be left to pedestrians, there doesn’t seem to be too many of them on this section of sidewalk on Beneva Road. After Beneva Road, you’ll turn left onto Palmer Ranch Parkway and cycle for a little over a mile until it comes to an end at McIntosh Road. Palmer Ranch Parkway doesn’t have a bike lane or shoulder, but it is fairly wide and only has light traffic. You will practically be right next to the Legacy Trail once you get to McIntosh Road. 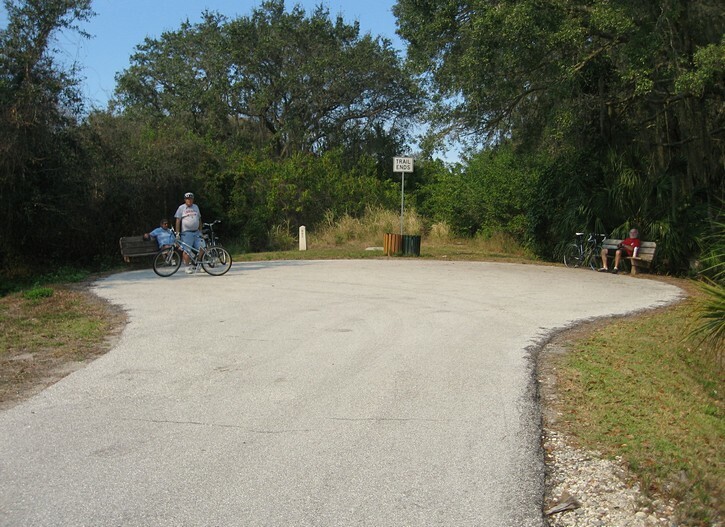 To find an access point to the trail, it is necessary to turn right on McIntosh Road and pedal for a little less than half a mile. Keep an eye out for a small sign for the trail on the left side of McIntosh Road (next to the entrance for the Culverhouse Nature Park). If driving to the Legacy Trail by car, you would stay on McIntosh Road for another mile to get to the parking lot mentioned earlier. It should be noted that McIntosh Road is a bit of an oddity insofar that it has an excellent bike lane for cyclists heading north, but nothing for those riding in the opposite direction. This means it’s a great route for the return portion of the trip, and not so great when heading south towards the trail. The Legacy Trail lends itself well to both beginners and seasoned cyclists, and much of this can be attributed to the fact there are many areas where you can ride surprisingly long stretches without having to cross a road. The trail does intersect some roads, but these are well indicated and fairly easy to cross, and there are traffic signals to help cyclists navigate the busier thoroughfares. The Legacy Trail is relatively new. It opened in 2008, and bridges and overpasses in the southern end of the rail were only completed in 2010 and 2011. As a result, it is becoming more and more popular every year, although it never seems to get too crowded. It is well used by pedestrians, rollerbladers, small groups of competitive cyclists out for training rides, but recreational cyclists are probably the most numerous. Many of them are middle aged or in their retirement years; some pedal very slowly, while others move along at a fairly good clip. 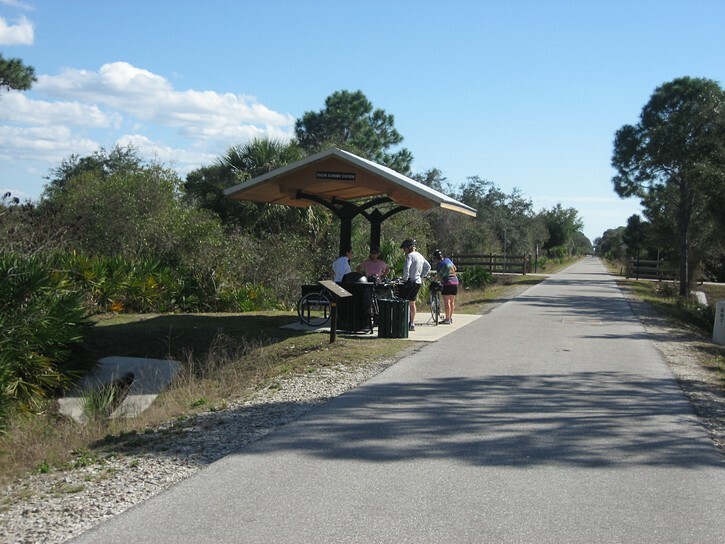 There are rest areas every couple of miles along the trail, and these tend to be equipped with a couple of long benches which are located under structures that provide shade or limited shelter from the rain. It is worth stopping at these if only for the opportunity to meet fellow cyclists and other users of the trail. 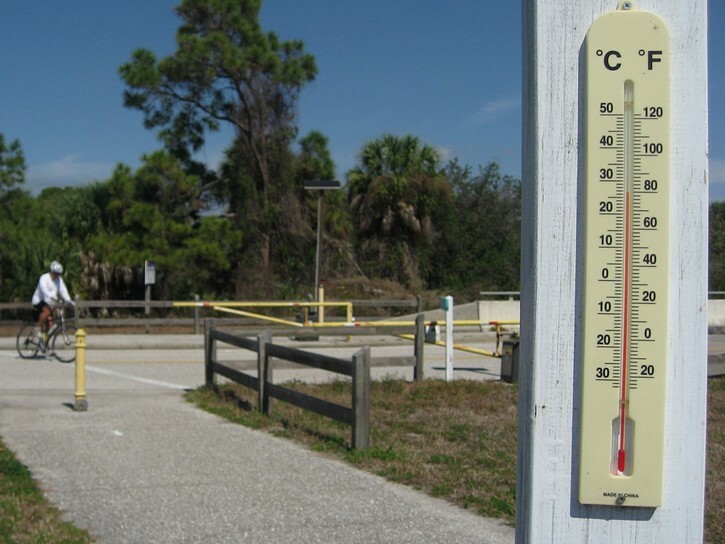 During the winter months you’ll find many of them are snowbirds from northern states or Canada who taking refuge in the summer-like weather that usually prevails in Florida at this time of year. Needless to say, they can be a excellent source of information about bicycling locally, as well as some great cycling routes and destinations in their home states or provinces. About half way to Venice the trail makes a slight detour around a small section of an old railway bridge. It was left in place to show what things used to look like when the railway was still operational. 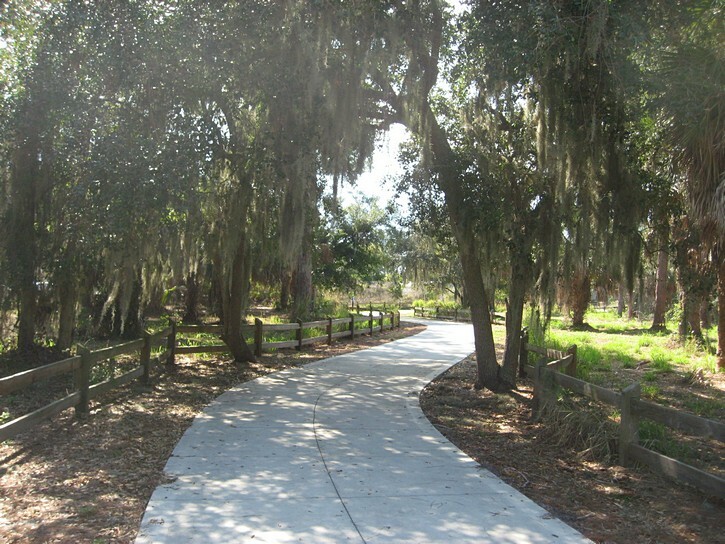 It is also in this area where the Legacy Trail cuts through the Oscar Scherer State Park. 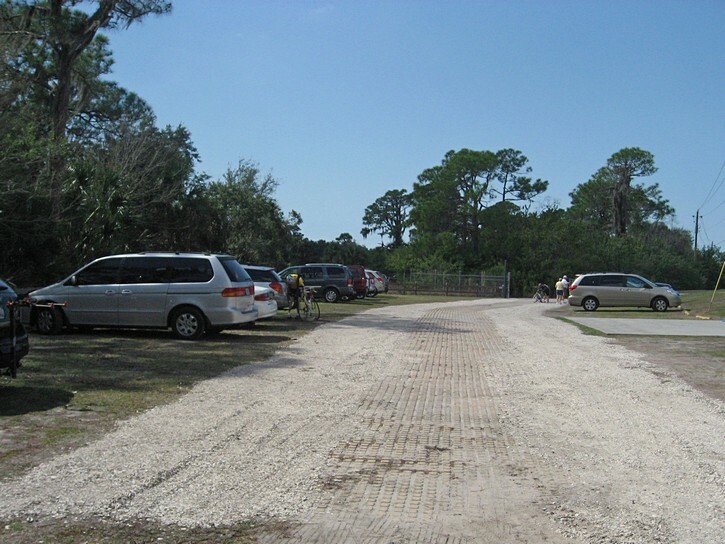 There is an access point to the park from the trail, but there is an entrance fee to get in. 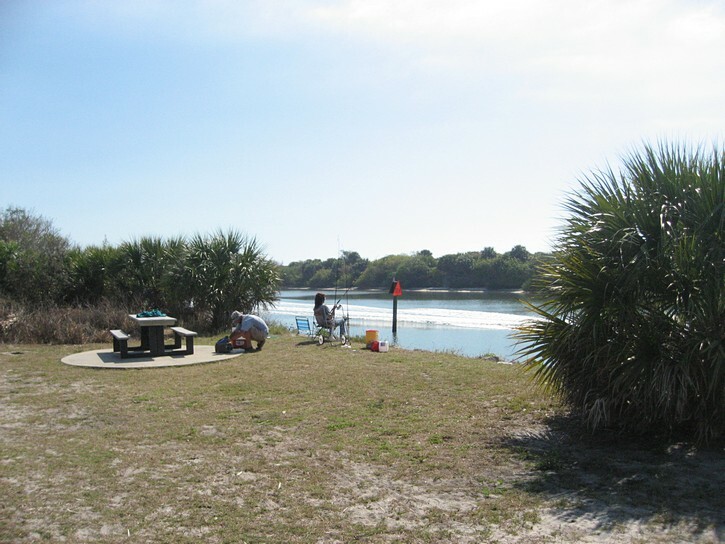 The park has hiking trails, camping spots, organized tours, and even snorkelling in its fresh water lake. In terms of cycling, the park trails seem better suited for mountain bikes than road bikes. As the Legacy Trail approaches Venice, it passes over two bodies of water (Dona Bay and Roberts Bay). The bridges over these bodies of water were recently built, and they provide cyclists with a great view of the surrounding wetlands and waterway. If you’re looking for a place to eat, and don’t want to cycle all the way into Venice, you have an option shortly after crossing the first of the two bridges. Captain Eddie’s is a seafood restaurant that is located in this area that’s about a third of a mile (600m) west of the trail. 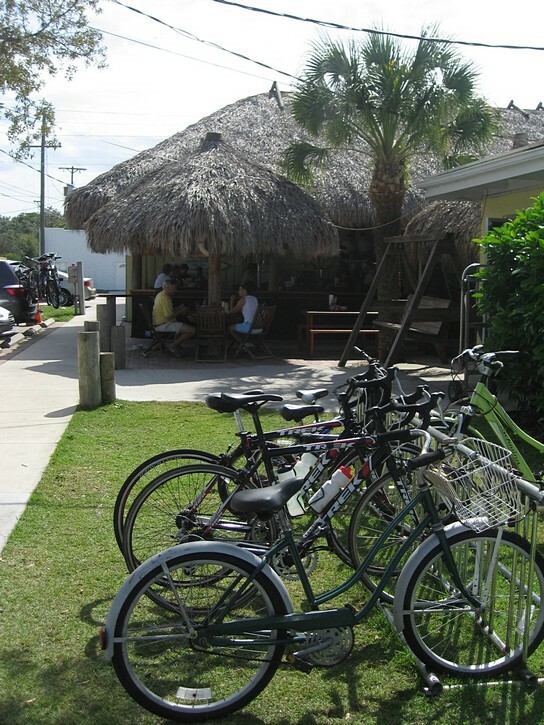 It seems to be popular with local cyclists, and it has a nice patio that comes complete with a tiki bar and thatched roof. To get to it, turn right onto Colonia Lane and stay on this road until you see the restaurant on your right (Colonia has a good paved shoulder). Captain Eddie’s could be used as a convenient turn around point for people who prefer to cycle shorter distances with a mid-ride lunch break. A view from a bridge on the Legacy Trail. 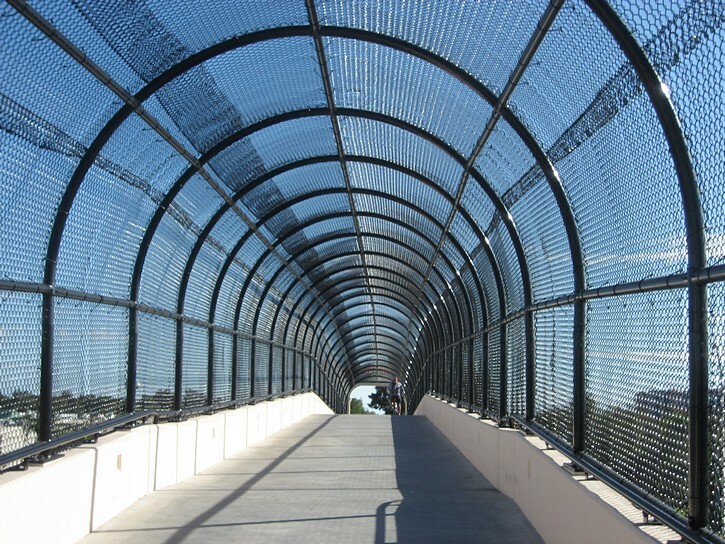 Cyclists continuing on to Venice will soon come to an impressive bicycle/pedestrian overpass which spans high above the Venice Bypass (a six lane expressway which is really part of the Tamiami Trail Highway). This overpass is a big improvement over what used to exist when cyclists had to do a major detour to cross this busy highway at traffic signals further to the east. 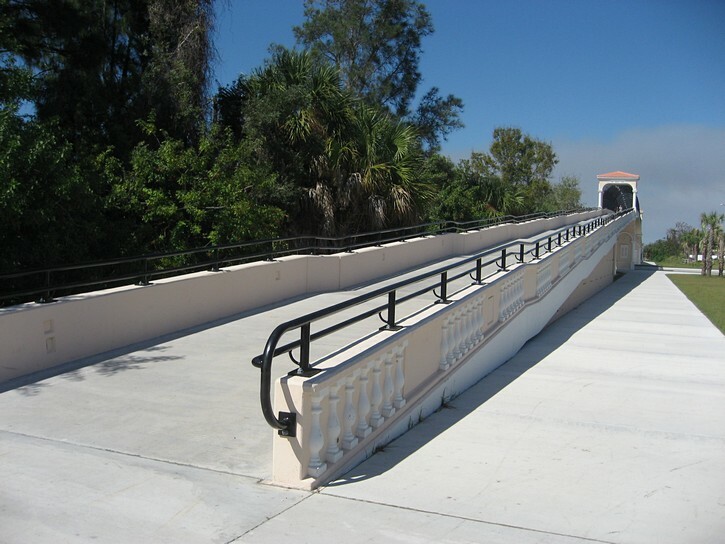 Although convenient, you will have to pedal up a bit of a hill to get to the top of this overpass, but this is the only climbing you’ll have to do to during the entire ride. On the other side of the overpass, just to the left of the trail, is a shopping mall. It houses a reasonably large bicycle shop (Real Bikes), which could come in handy if your bike needs parts or servicing. From this point, you’ll only have to cycle a very short distance to get to the southern end of the Legacy Trail. You’ll know you’re there when you pull up next to the old Venice train station (The Historic Venice Train Depot) in the middle of what is now a park. 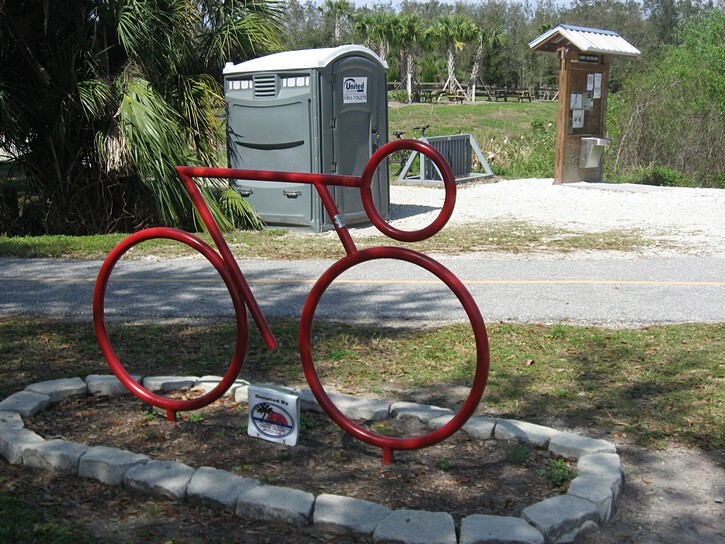 There are public restrooms here as well as a parking lot which would be useful for people who like to bring their bikes by car and start the their ride at the southern end of the trail. Venice has a population of a little over 20,000, and its downtown core is located a short distance west of the old train station. It is certainly worth a visit. It has an interesting layout that was designed by a world-renowned city planner in the 1920s, and more recently, it was awarded a ‘Silver’ designation for being a bicycle friendly community by the League of American Bicyclists. 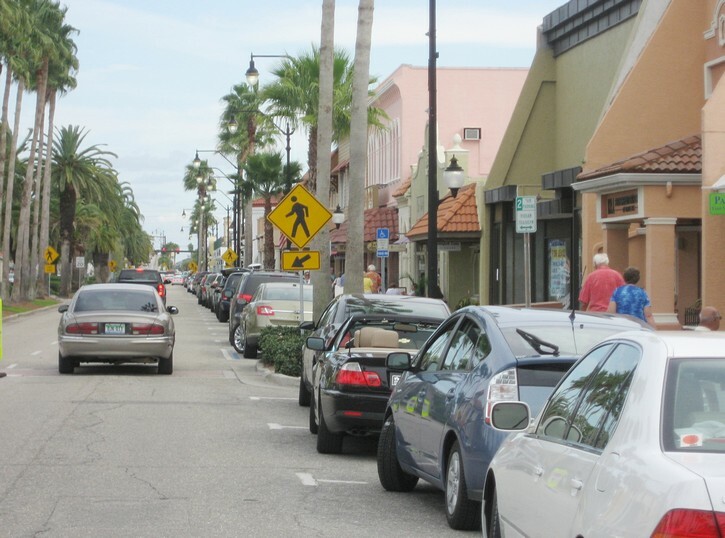 The only problem is that downtown Venice is on the other side of a narrow strip of water that is part of the Intracoastal Waterway (ICW), and it is necessary to take a bridge to get there. Although there is a bridge that runs right through the middle of the park with the old train station, using it is not as straight forward as it could be. First, you have to pedal one or two blocks in the wrong direction to get to the beginning of the ramp that leads to the bridge. Once there, you’ll notice a cautionary sign advising people to “Walk bikes across bridge”. 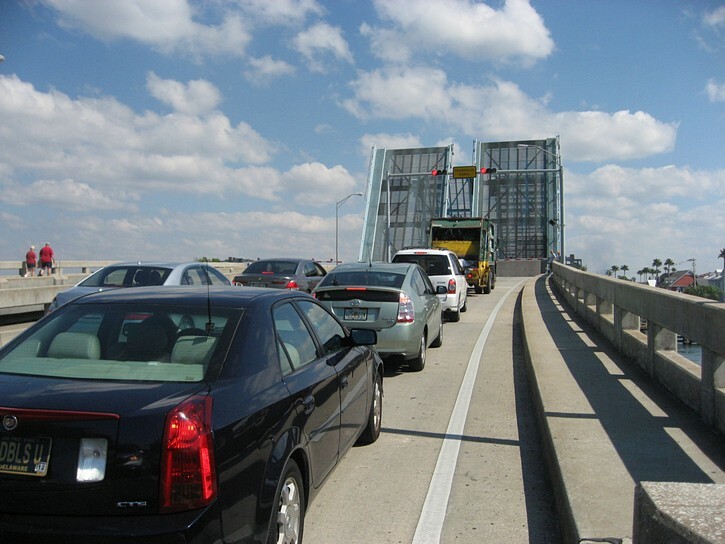 Doing so is probably a good idea since the bridge is narrow, doesn’t have a shoulder to ride on, and can be quite busy. 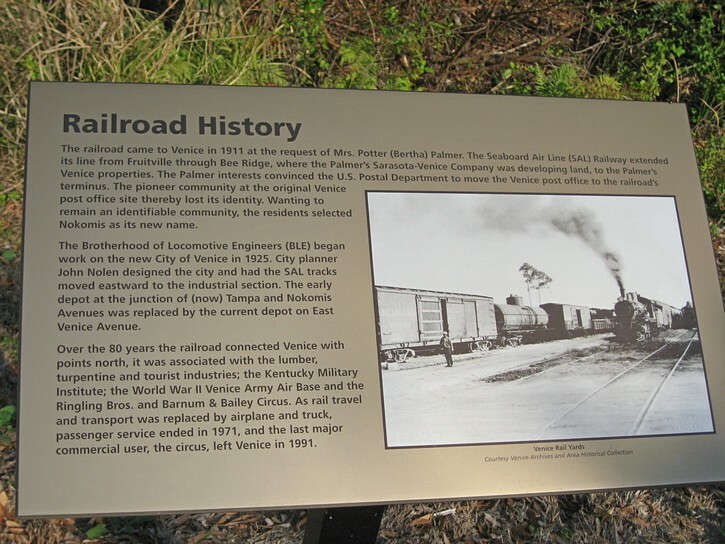 of the Legacy Trail in Venice. It should be noted that local bicycle groups recommend that cyclists use the North Bridge, which is fairly wide and has a good bike lane. The North Bridge is about half a mile northwest of the old train station, but how to get to it from the Legacy Trail isn’t all that evident. For this reason, a local organization has prepared a map to help people figure things out. Regardless of which bridge you take, downtown Venice will only be a block or two away. It is centred on a short segment of Venice Avenue just west of the ICW (and to a lesser extent, along Miami Avenue, one block to the south). Venice has an attractive downtown core where you will find a good selection of restaurants, pubs, boutiques, and other small speciality stores. 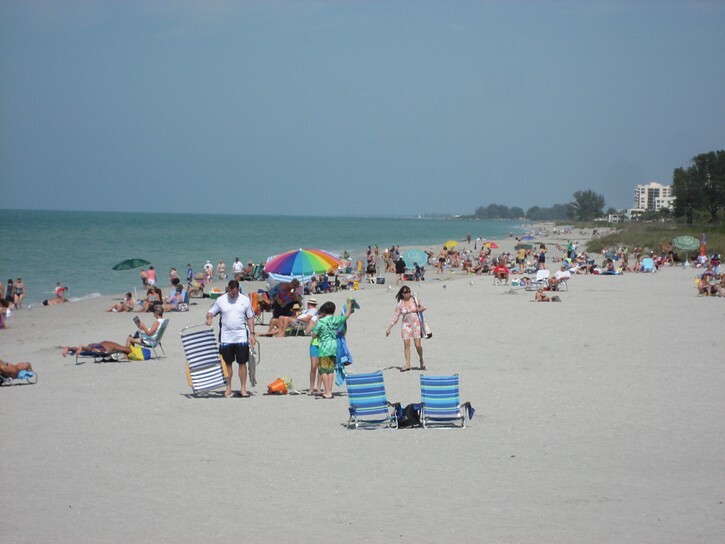 If you continue west on Venice Avenue for another 4 or 5 blocks you’ll come to the town’s municipal beach on the Gulf of Mexico. 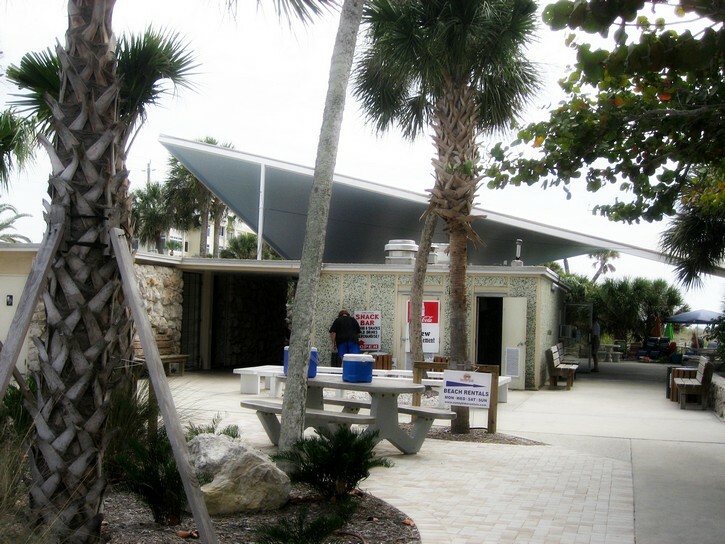 It’s a fairly nice beach and there are public restrooms, a snack bar, and a few picnic tables in the area. 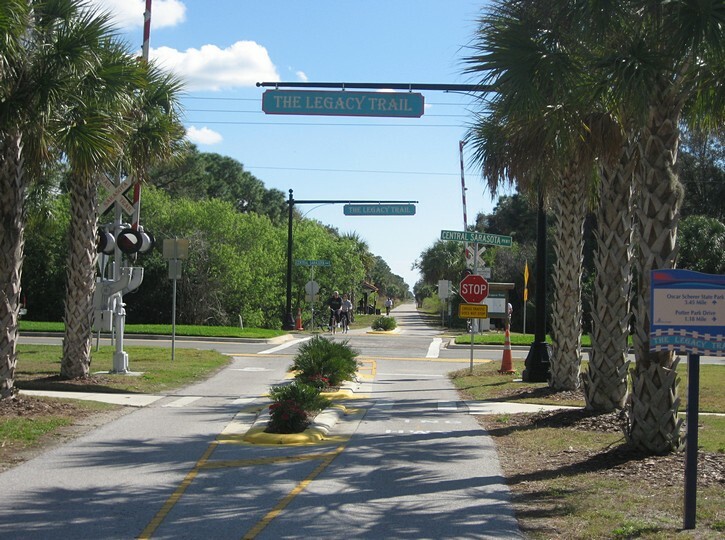 After stopping for a break or lunch in Venice, you can head back over the ICW and cycle north on the Legacy Trail to wherever you started your ride. 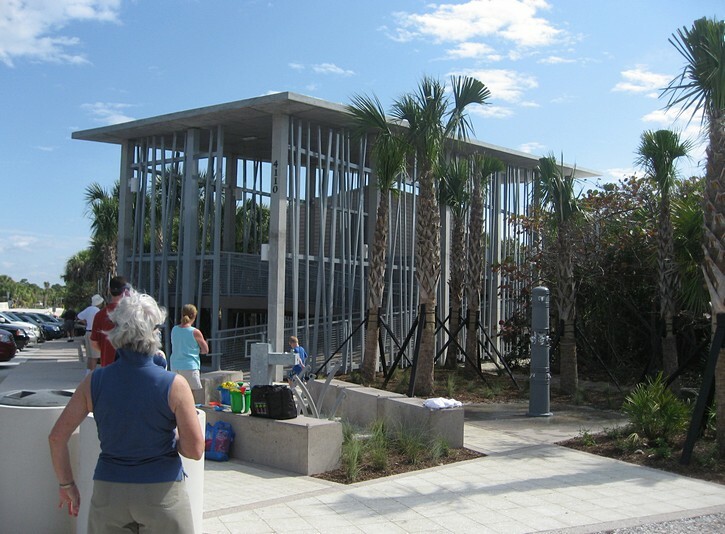 However, if you’re ready for more, you can cycle south for another 4 to 5 miles (6.5 to 8 km) on the multi-use trails in the Venetian Waterway Park. 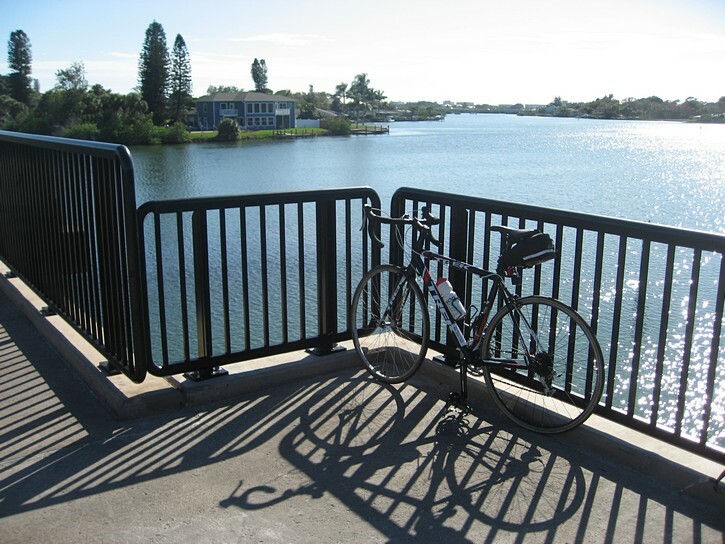 There are two different sections for Venetian Waterway Trails. One runs along the east side of the ICW, and the other along the west side. 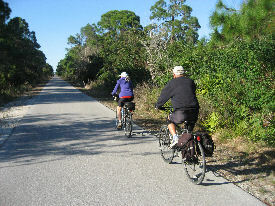 Venetian Waterway Trail on the east side the ICW is, for all practical purposes, the continuation of the Legacy Trail. When you get to the end of the Legacy Trail, keep on pedalling, and you’ll automatically end up on the Venetian Waterway Trail. 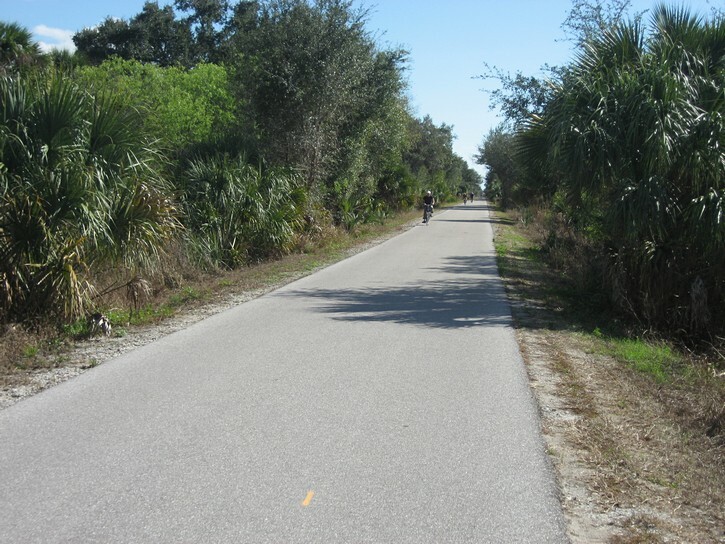 You’ll know that you’re on a different trail system because the Venetian Waterway Trail is slightly narrower, and it’s made of concrete as opposed to the Legacy’s asphalt surface. 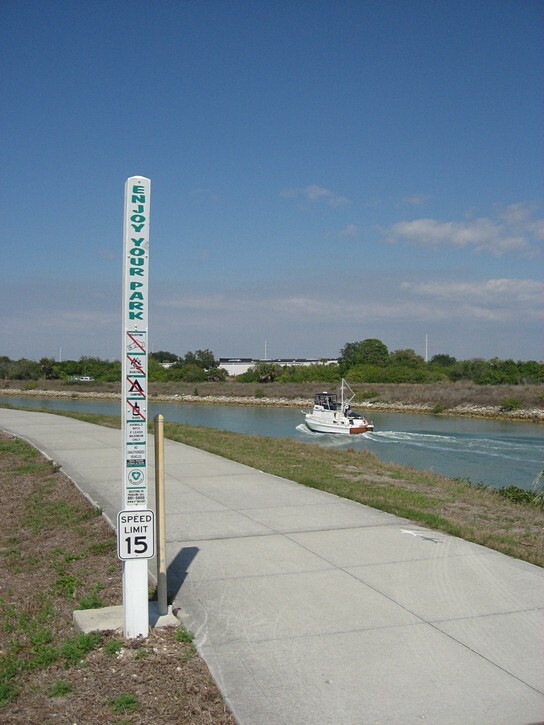 This section of the Venetian Waterway Trail runs right next to the ICW, and you’ll often be able to see a procession of small and large recreational boats heading out or returning from the Gulf of Mexico. 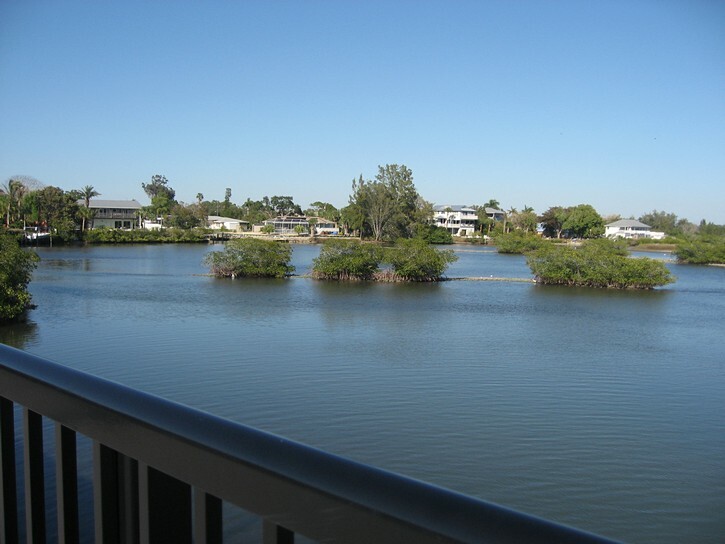 Although the view is pleasant enough, this part of the ICW is a man made channel, and these are never as attractive as a natural body of water. 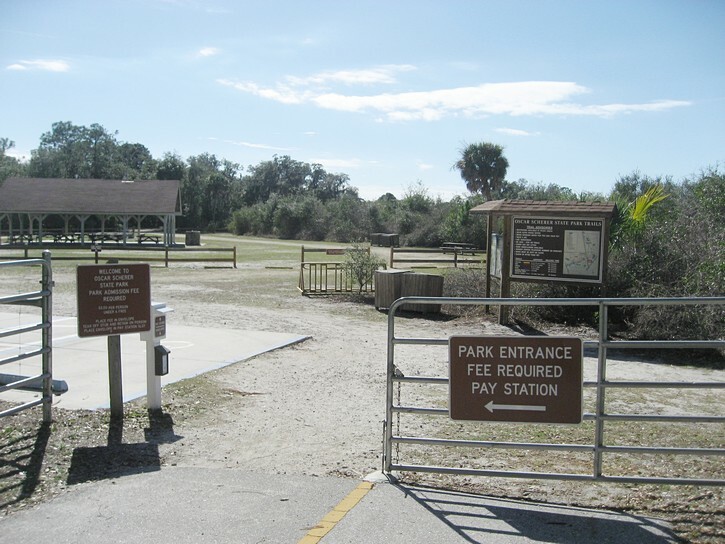 This section of the trail comes to an end at the Shamrock Park Nature Center, where you will find picnic tables, a playground, and some recreational facilities. This is usually the turn around point for most people, but it is possible to head further south when cycling on the east side of the Intracoastal Waterway. To do so, you’ll have exit on the east side of the Nature Center, and, with the assistance of a map, cut through a residential district in a southeast direction to get to the bicycle lane on Englewood Road. Although Englewood Road has a good bike lane, it also has a fair amount of traffic, and it’s not a great cycling destination by itself. Nevertheless, it’s an option for people who would like to cycle to some point further south. 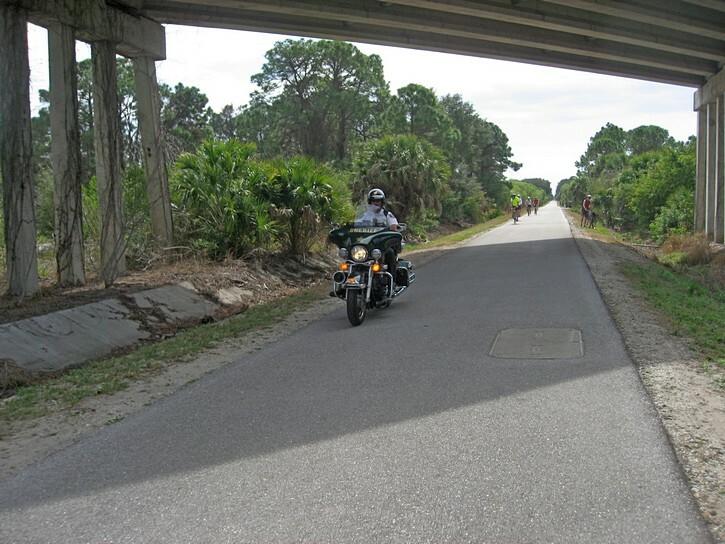 You can also explore the section of the Venetian Waterway Trail that runs on the west side of the Intracoastal Waterway. 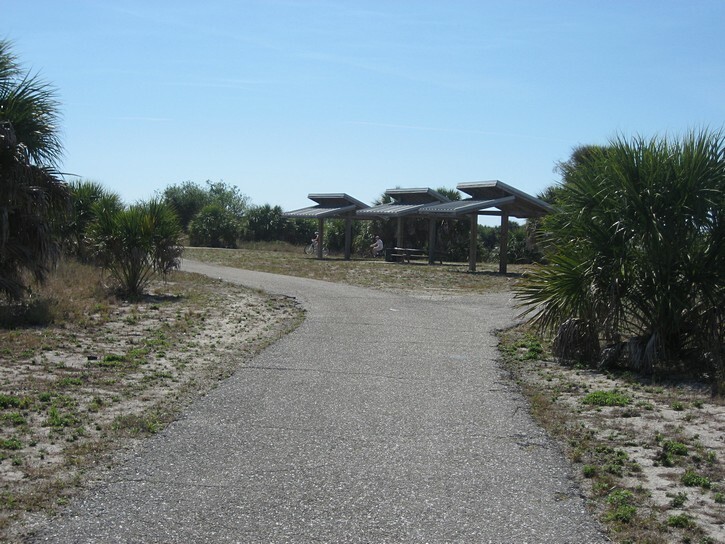 It is located on the same side as downtown Venice, and it is probably the more interesting of the two trails that run along the ICW. You can only go south for four or five miles, but it is possible to return to Venice by completing a loop on roads the run next to the Gulf of Mexico. To get to the Venetian Waterway Trail on the west side of the ICW, you’ll have to cross one of the bridges that leads to downtown Venice. 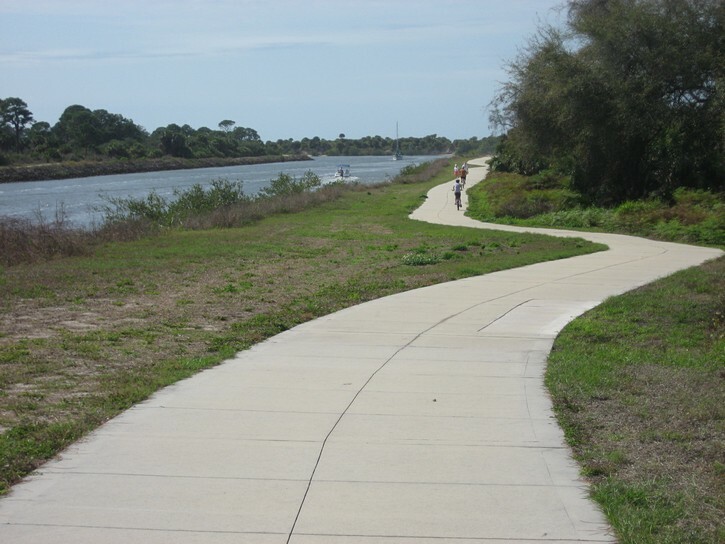 Instead of continuing towards town, head to the water’s edge beside the ICW and you’ll find the beginnings of the Venetian Waterway Trail. For the most part, this section of the trail also runs right next to the waterway, but there is one area where is takes a big detour inland to get around a trailer park and residential development. Fortunately, it is well marked and easy to follow. 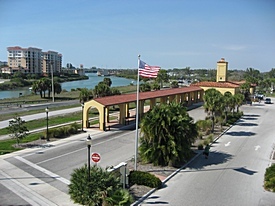 A view of the pier when returniung for the Venetian Waterway Trail. A little further, the trail seems to come to end just before a large powerboat marina. 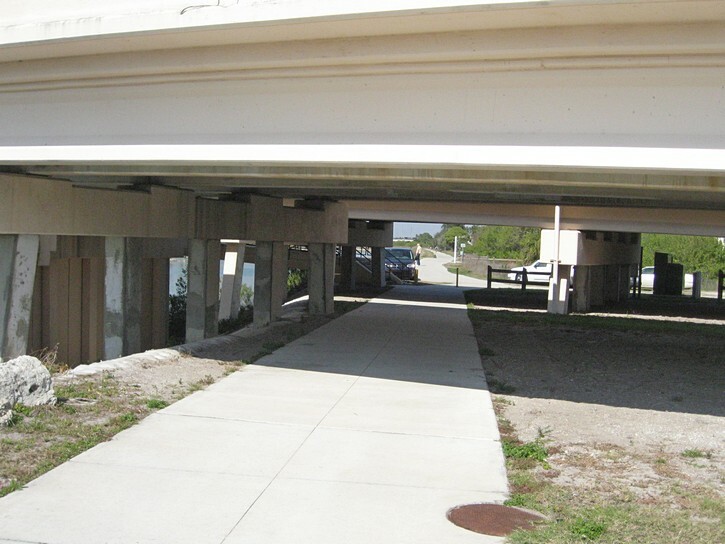 However, there is a turn off a few hundred feet before this point, and it will take you around the marina basin (& automobile dealership) and deposit you next to the Tamiami Trail Highway. 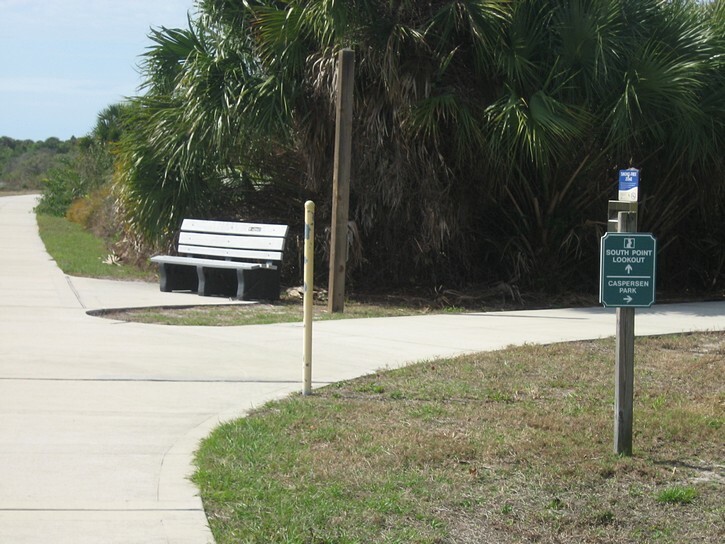 To get back to the Venetian Waterway Trail, head back towards the ICW on the sidewalk next to highway for several hundred yards (it is not clear if this sidewalk is part of the trail network, but it is wide and seems to be devoid of pedestrian traffic). From here, the Venetian Waterway Trail passes behind the Venice Municipal Airport and comes to an end in a little over a mile. You can obviously turn around and head back the way you came. 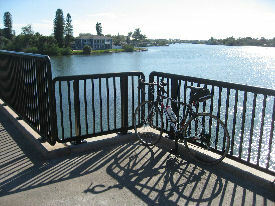 Another option is to complete the loop to Venice by riding along the Gulf of Mexico shoreline. To do so, take the turn off for the Caspersen Park, and use your sense of direction to head due west towards the Gulf of Mexico (it’s only a few hundred yards away). There are a few side roads in that park that you could take by mistake, but they don’t go far so you can’t get very lost. You’ll eventually end up next to a structure in the park that houses public restrooms. 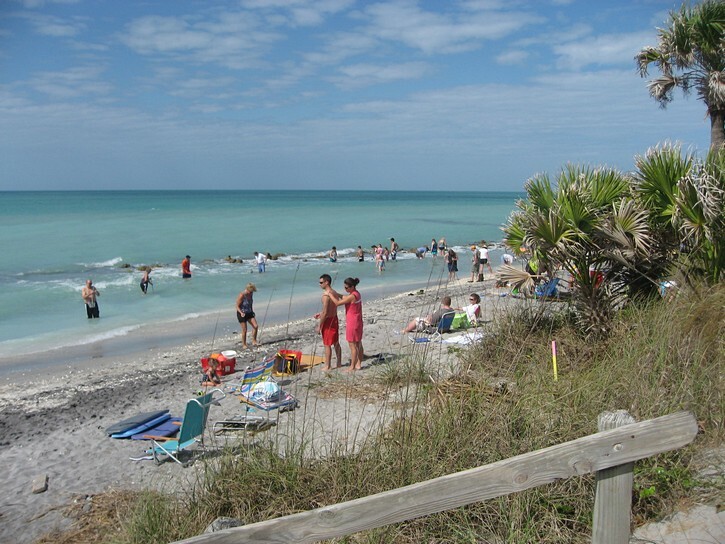 To the south is a long narrow beach that is very popular with individuals looking for fossilized teeth from giant 50-foot sharks that used to swim Gulf waters in prehistoric times. When the weather is nice you can see dozens of people shifting through the water and sand with special rakes and other instruments looking for these ancient shark teeth. To the north is the road that will lead you back to Venice. 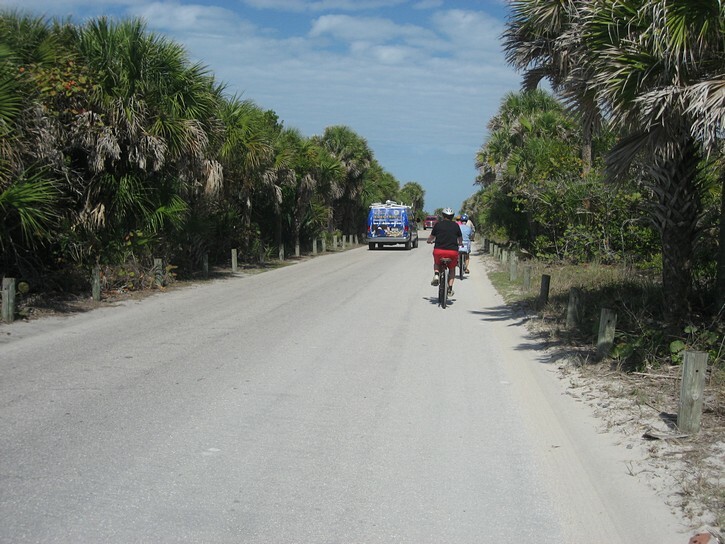 Although the presence of beach goers and park visitors means this narrow road can be full of cars on sunny days, everything seems to move bicycle speeds so its easy navigate through the traffic. The road widens a little later, and at this point there’s a good paved shoulder to ride on. You’ll soon pass by large parking lots for beaches on your left, and the Venice Municipal Airport on your right. 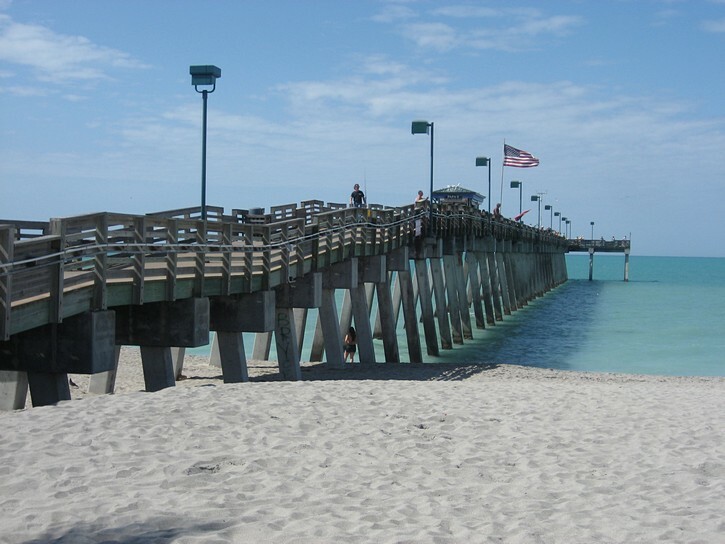 This is where you should keep an eye out for a rather large pier that jets out into the Gulf of Mexico. 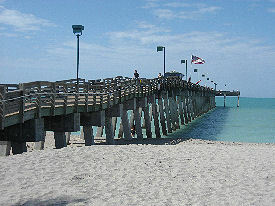 At the base of this pier is Sharky’s restaurant and bar. 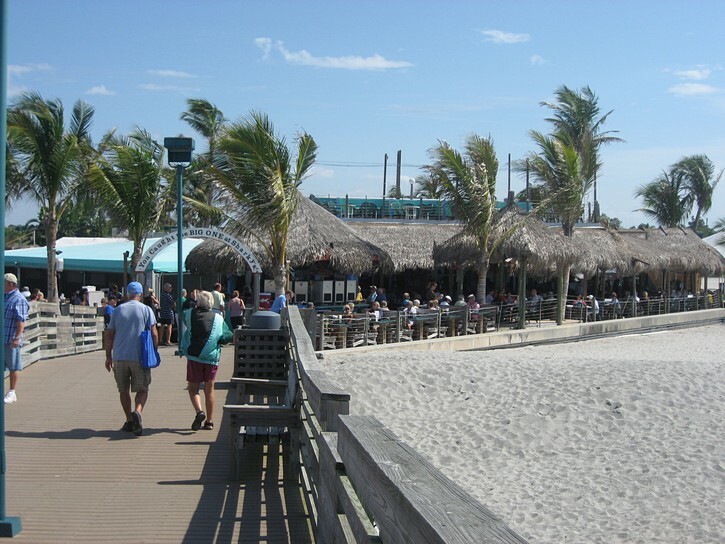 It is one of the few restaurants in this part of Florida that is located right on the beach (as opposed to next to the beach). You may want to stop here for a cold beer or to grab a bite to eat, or simply to walk out to the end of the pier. There are public restrooms next to the restaurant. 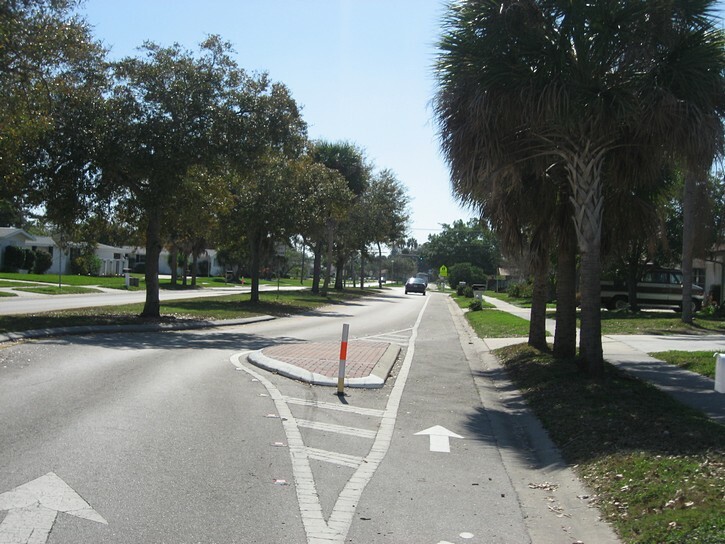 Once you’re back on the bike, continue north toward Venice on Harbor Drive, which has a well designed bike lane. After riding through a residential area for 12 to 15 block, you’ll to come to Venice Avenue. 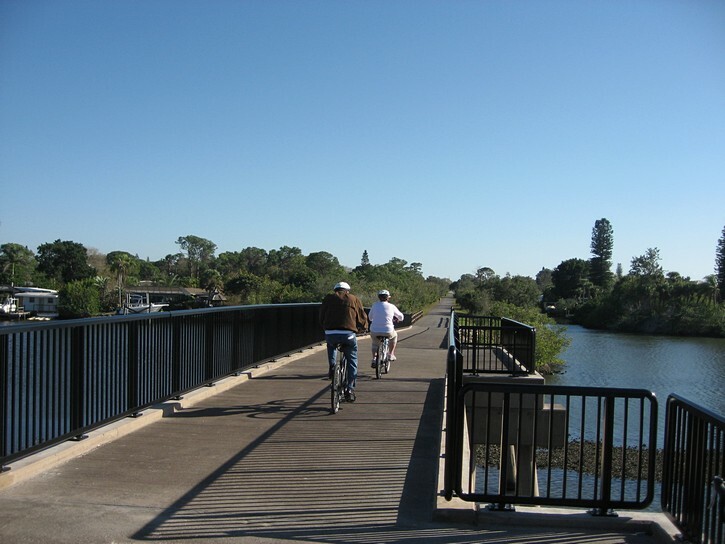 Turn right and cycle through downtown Venice to one of the bridges that will take you over the ICW and to the beginning of the Legacy Trail. You’ll now have completed the loop and be able to head back north to where you started your ride. The Legacy Trail & Venetian Waterway Trail Click here to see a larger scale map.